Write a program to print factorial of a number using recursion in C. In this program, we have to write a code which takes an input number and print factorial of a number using recursion. Before solving this problem, let's first understand what is recursion? And the difference between recursion and iteration. In Recursion, A function calls itself until the base condition is reached. Using recursion, we can write much cleaner and shorter as compared to iterative code. You can learn more about recursion using following tutorials. In this tutorial, we are going to use recursion to print factorial of a number. In my previous post, i have explained how to print factorial of a number in c using iterative approach. 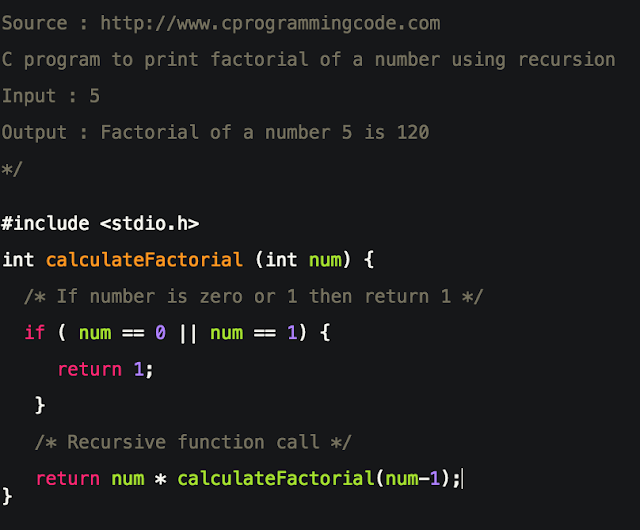 Let's write a c code to print factorial of a number using recursive approach. In this program, first we take input number from a user then we call a calculateFactorial() method to calculate factorial of a number. Suppose you have entered 5 so how this program is going to be executed.